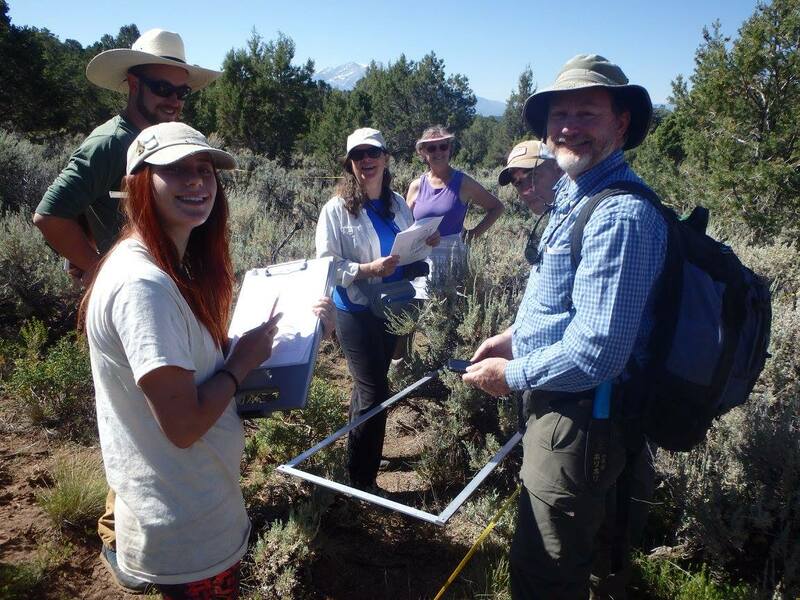 The Interactive Roaring Fork Observation Network (iRON) is an AGCI project to collect and share data on climate and environmental conditions in the Roaring Fork Valley. The website features live and archived data from AGCI’s network of soil moisture sensors. The site also includes links to further information about the field stations, links for other environmental data from the Roaring Fork Valley, and a blog on weather and soil observations in the valley. 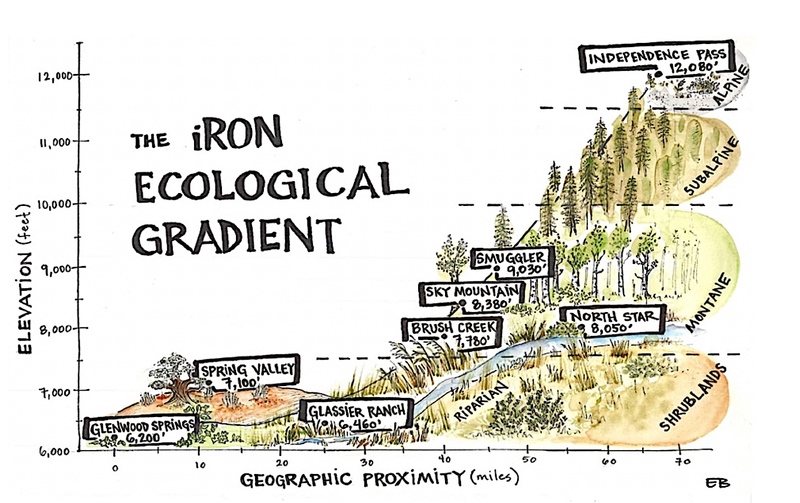 The interactive Roaring Fork Observation Network (iRON) is a research and outreach effort managed by AGCI that seeks to improve understanding of our local ecosystems in the context of a changing climate. Soil moisture plays an important role in both ecology and water supplies. A clearer understanding of how soil moisture relates to these systems has the ability to help inform both scientific studies and resource management about how best to prepare for the future. From decisions about what plants are most likely to survive in this region under future climate conditions to improving forecasts of growing season water availability, this project is intended to generate information that can be directly applied to questions prevalent in the community. Measurements of soil moisture, soil temperature, air temperature, and rain are gathered by 9 stations, located in Roaring Fork Valley in the southern Rockies of Colorado. The iRON website (agci.org/iron) shares the data collected by the monitoring network and offers additional resources for understanding how these data relate to life in the Roaring Fork Valley. For example, the station pagesprovide general information about each iRON site, while an informal blog shares insight into field work experiences, graphs (updated twice annually) offer comparison of variables like rain events, soil moisture, and temperature across different years, and pages on climate and history in the Roaring Fork Valley use specific local historic examples to help inspire questions about the interplay between human societies and the natural environments that support them. The Roaring Fork Valley is a 1,451 square mile (3,760 square km) watershed located in the Rocky Mountains of Colorado. A watershed is defined as the area of land where all water running under or over that land drains to a common point. In the Roaring Fork Watershed, that point is the confluence of the Roaring Fork River and the Colorado River in Glenwood Springs. Because of the wide range of elevations contained within it, the Roaring Fork Watershed hosts a variety of ecosystems, ranging from delicate high alpine habitat above 12,000 feet (3,660m) on Independence Pass to dense growths of scrub oak at 5,600 feet (1,700m) at the north end of the valley. In between are a variety of ecosystems including mixed conifer forests, aspen stands, high elevation meadows, riparian zones, and juniper/sage shrublands. Over 26,000 people live in the Roaring Fork Watershed. Recreation, particularly skiing, forms a key staple of the economy, but legacies of farming, ranching, and mining remain. As the population in the area is projected to continue growing, relationships with the natural environment also continue to be redefined over time. Questions of development, water availability, wildlife conflict, and use of parks and trails are being considered not only from a perspective of local pressures, but also in the context of how global climate change may impact the mountain economy and ecology. The fact that iRON stations run from the top of the watershed to its drainage makes the network a unique resource for understanding watershed dynamics. Soil moisture is critical in shaping ecosystems, helping to determine which plants will survive. It also acts as a middle man in the water cycle, playing a role in water allocations between vegetation uptake, evaporation, and run-off. Consequently, the relationships between snowmelt or rain and changes in streamflow are also tied to soil moisture levels. As climate changes occur in our valley, soil moisture is likely to change also, but how those changes will occur and their likely impacts will only be revealed if long-term observations can offer a record of conditions over time. The iRON will help to provide a valuable record of this kind. It is hoped that the data collected by the iRON will benefit every local land managers, local water managers, and the international research community.